Powers/Abilities: Imhotep's form is undead, and any wounds he receives close up in seconds. He can transform himself into sand, fly in the form of a sandstorm (and transport others within himself), and control the elements (sand, water, the weather). He is able to move things at a distance with a gesture, and under certain circumstances can control the minds of large groups of beings, be they human or insects. His strength is superhuman, as his agility - he can scale walls and ceilings like an insect. He can awaken other mummies and make them do his bidding. He is an adept sorcerer, and can even resurrect the dead fully given the right circumstances. He is still vulnerable to certain ancient Egyptian spells contained within the Book of Life. The Gods of Egypt can strip him of his powers. Immediately after he is resurrected his powers are weaker, and by the curse he is under he needs to consume the lives whoever opens the box containing the canopic jars which store his internal organs in order to regenerate his form and powers. History: Five thousand years ago Imhotep was the High Priest of Pharaoh Seti I. Behind his lord's back, Imhotep was carrying out an affair with the pharaoh's wife, Anck Su Namun, and when Seti discovered this, the two lovers murdered him. The Pharaoh's guards burst in on them, and Anck Su Namun told Imhotep to flee while she bought time. Then she killed herself, confident her love could resurrect her. Imhotep stole her corpse and took her to Hamunuptra, the City of the Dead, but before he could finish the ceremony to reunite Anck Su Namun's spirit with her body, the guards once more caught up with him. As punishment for his heinous crime, Imhotep was severely punished, mummified alive and sealed within a sarcophagus with flesh devouring scarabs. Millennia later Imhotep was revived when two expeditions discovered Hamunuptra. One, consisting of Rick O'Connell and the Carnahans, discovered his corpse. The other, led by three Americans, opened the chest containing his organs, thus inadvertently making themselves the targets of his hunger once he awoke. The final stage was initiated when Evie Carnahan read from the Book of the Dead...and Imhotep awoke. The explorers fled to Cairo, but Imhotep swiftly sought out the people who had taken his canopic jars, draining them of life and restoring himself in the process. Then he chose Evie to be a sacrifice to restore the life to Anck Su Namun. O'Connell and Evie's brother Jonathan raced him back to Hamunuptra, where the ceremony was to be carried out. Jonathan read from the Book of Life, the Book of the Dead's counterpart, stripping Imhotep of his supernatural powers, and then Rick ran the now mortal priest through with a scimitar. As he died, Imhotep's form returned to its mummified state. Minutes later a thief who had allied himself with the Mummy triggered a booby trap, which buried the entire city beneath the sands. Nearly a decade later Egypt entered the Year of the Scorpion. A group of cultists, led by Anck Su Namun's reincarnation, Meela Nais, sought to steal the power of the fabled Scorpion King, a servant of Anubis who was fated to arise in that year. 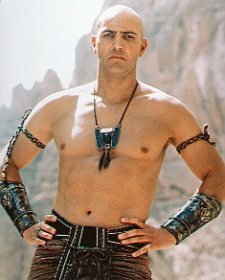 Believing the one being with sufficient power to defeat this foe was Imhotep, the cultists dug him up and once more awoke him. Meanwhile Alex O'Connell, son of Rick and Evie, had inadvertently donned the Bracelet of Anubis, activating the magic which would both guide people to the Oasis of Am Sher where the Scorpion King resided, and also awaken the demon. 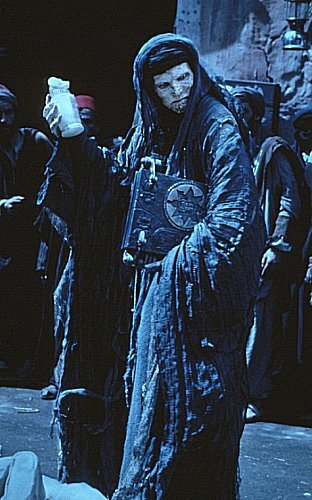 The cultists kidnapped the child, and led by Imhotep (who soon reunited Anck Su Namun's soul with Meela Nais' body), they set off to the Oasis, hotly pursued by the child's parents. The groups arrived at the Oasis on the morning that the Scorpion King awoke. Imhotep found himself stripped of his powers once more, this time by Anubis, and when faced by the Scorpion King, he feigned allegiance, and let the creature attack Rick O'Connell instead. However Rick prevailed, killing his foe. He and Imhotep grappled as the temple they were in began to break up, and both fell into a chasm to Hell which opened up beneath them. Both men narrowly managed to grab on to the edge; Rick told his wife to leave him and get to safety - she ignored him and managed to pull him up; Imhotep cried out to his beloved Anck Su Namun to come to save him - she fled, and heart-broken, Imhotep relinquished his grip, and fell into the grasp of the damned souls below him, who tore him to shreds. In the cartoon series loosely based on the movies, Jim Cummings supplies his voice. 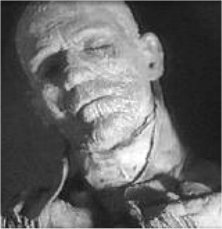 In the 1932 Universal Horror movie which inspired the 1990's Mummy, the part of (a very different) Imhotep was played by Boris Karloff.